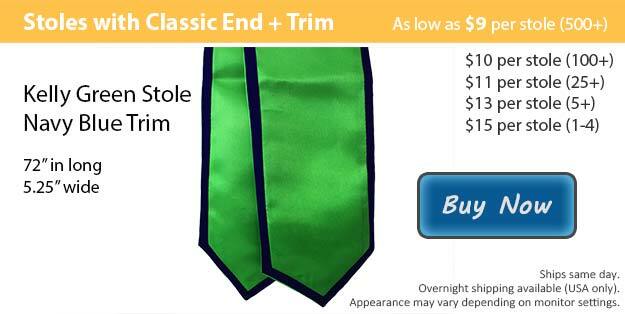 We have a kelly green stole with navy blue trim that would be a terrific way to wrap up your outfit and symbolize a special achievement that you have accomplished. Graduation stoles are also a great way for groups or clubs to remain a unit. At Honors Graduation we know that reaching your goal to make it to graduation is no walk in the park. It has taken years of hard work, requiring you to give your maximum effort on a daily basis to reach this level of success. Your graduation is a monumental day in your life and it is important that you dress appropriately. As you join your fellow graduates at your ceremony, your family and friends will also be there to cheer you on and give you their support. It is a tradition practiced around the globe for graduating students to dress in a cap and gown for their graduation ceremony. Additionally, many students have also been known to personalize their wardrobe with various graduation accessories. At Honors Graduation we have all the graduation gear that you might want or need to be ready in time for your ceremony. Here at Honors Graduation we have a handful of different options to pick from when creating your graduation stole. There are two styles to choose from, either our angled cut or the classic option. Stoles come in lengths of 72 or 60 inches. Our stoles may be purchased with or without contrasting trim. We have over fifteen colors for the main color of your stole as well as the trim on it allowing you to mix and match to create the best stole for your wardrobe. We also offer stole customization as well for an additional fee. Our customization team can add the wording or image that you select right onto your stole using embroidery.